noun: Derived from the natural black pigments of bone char. 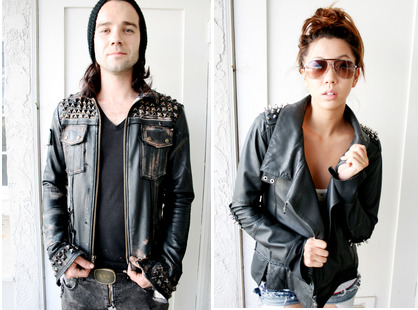 Jenny Wu and Brian Totten are the masterminds behind the line Bone Black. Based in Los Angeles, the collection is anything but conventional. Every custom piece is locally made in Los Angeles, California. Only made when its ordered, and packed by the hands of the Bone Black Team to insure each order meet the highest stands of rock and roll. Every piece of fabric is hand picked, dyed, distressed, and put together making sure that each item is thought out and personal. Inquires for custom clothing please email us at info@boneblackla.com or go to our contact us page and use the form provided. Bone Black was started in Los Angeles in July 2013 by Jenny Wu & Brian Totten. Jenny Wu, Co-designer and creative marketing director of Bone Black, graduated with a major in Fashion Design and a Bachelors in Apparel Merchandise Design and Production from Iowa State University. As a fashion lover, she was tired of the mass produced fashions found in most department stores. She wanted to create something different. Brian Totten, Co-designer and Production manager of Bone Black was a musician who could not find unique clothing, and begain making his own clothing. Together they started Bone Black to provide musicians and entertainers rock'n custom clothing.